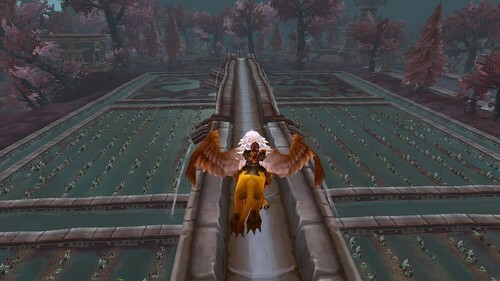 Remember flying around the zone Zul'Drak in Wrath? It was not my favorite zone. I didn't like the color palette chosen; blue, white, gray, brick red, brown. The story line through ZD was interesting, but some of the questing was difficult and was a lot of "go here and kill 15 of these". The best part was freeing the troll animal spirits. One of the interesting things about Zul'Drak was the broken irrigation system around the east side of the zone. I think this was modeled on the ancient Roman aqueducts which still work in some areas of the world. Sections of ZD's aqueducts are broken so the water doesn't travel the full length of the system. This section is over by The Argent Stand. I have always thought it would be way cool to have a quest and achievement to ride the system from start to finish. It would be like Donkey Kong's mine. You remember playing that, right? You'd get a small raft or boat and have to leap it over the broken sections, picking up power ups to make you go faster or leap broken sections with ease. Leaping, hopping or jumping is something I do not do well. I would, however, spend a lot of time trying to ride this if there was an achievement for doing it.